I loved doing this little painting. I wanted to show that as it is above it is below. This tree may have it's leafy head in the heavens but it's roots gather the good earth energy to bring it long life. 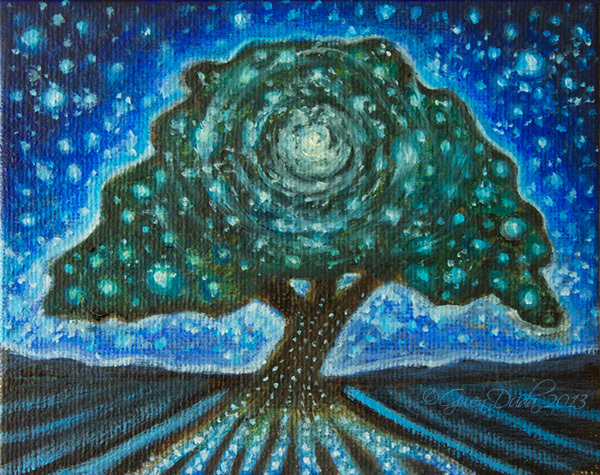 I wanted to convey the magic of the essence of existence for this tree, the field in has rooted in, the mountains in the distance and all of life, above and below. It measures 4" x 5" done in professional archival quality oil paints on canvas panel.